Georgian National Music Center and Nikoloz Rachveli Present Shakespeare in Symphonic Music. The event was held in the Georgian National Opera and Ballet Theater of Tbilisi formerly known as the Tiflis Imperial Theater. 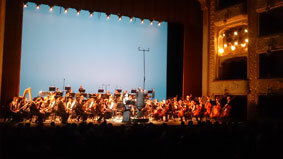 Georgian Philharmonic Orchestra was performing which was conducted by Vakhtang Matchavariani.